The structure of digital humanities projects is often predicated on a manual or guidance document that supports project frameworks and outcomes. Heather F. Ball (St. John’s University), and Kate Simpson (IASH Fellow at Edinburgh University), as a librarian and literary historian respectively, have begun to explore the role of such documentation in the work of Livingstone Online and what that means for contemporary critical digital practice. In this post, they propose that these guides are both the crucial document by, and the site in, which knowledge is shared. Importantly, they suggest that such documentation can be used to facilitated subversive readings of historical nineteenth century European imperial hegemonic narratives. Most digital humanities projects are production-based schemes. Their structure is often predicated on a manual or guidance document that explains how to produce, develop, and implement a part, or whole, of the project outcome. Such documents guide and shape the practice of the project, ensure quality control, and outline project procedures. More specifically within a transcription-based digital project, a coding or instruction manual is often used to ensure everyone applies the same rules to the texts, documents, or manuscripts being encoded. But these important project-shaping manuals can often take a backseat to the front-facing project outcomes and deliverables. What role do such documents play in the overall pedagogy of a project and are they as critically explored as the outcomes themselves? As scholars, we have worked together for over eight years on Livingstone Online, a digital humanities project. The project captures and collates material created by and circulated to David Livingstone, a Scottish Victorian missionary, explorer, and expeditionary writer. Until recently, we gave little pedagogical thought to the tools that facilitated people whose areas of interest were 400 years apart – a medievalist and a postcolonialist – working effectively together. How do such, often dry and technical, documents enable creative engagement and production? We think these documents need greater analysis and engagement given how foundational they are to many digital humanities projects. As a librarian and a literary historian our work has lately led us to shine a light on and examine the role of such documentation and what that means for our critical digital practice. We suggest that these guides are both the crucial document by, and the site in, which we share knowledge. They enable us to collaborate without having the same scholarly knowledge and thus our work engages with each other in the space in which the manual sits. We want to explore how a medievalist librarian and a postcolonial literary historian can come together in the same medium, and how our work through the coding manual speaks to the larger conversation on interdisciplinary approaches to enriching the global nineteenth century corpus. Not only that, but we are particularly interested in how our critical engagement with TEI-XML mark-up language, and in our coding behaviors, facilitates a model of digital archival practice which aims to actively subvert nineteenth century colonial and imperial ideologies of power and agency. The following discussion will look at what we think is the role of digital humanities project documentation in critical pedagogy and practice. 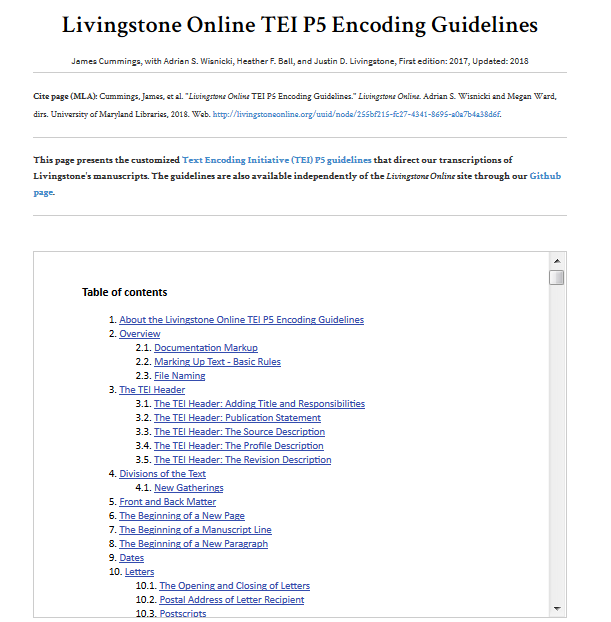 If you wish to explore the manual we will be talking about, it can be found at http://www.livingstoneonline.org/resources/livingstone-online-tei-p5-encoding-guidelines. Livingstone is unique in his cross disciplinary interest; from scholars of exploration to colonialism, from anthropology to geography to African history to medical history, a rich cross-section of information and artifacts can be found within his works. His manuscripts show how scientific and political networks across the Victorian globe were set up and how the metropolitan center related to the imperial periphery. Through his writings in particular he not only documented his travels but, to paraphrase a journalist from 1876, he exploded the notion of Africa as a “howling wilderness”’ to British Victorian audiences. These writings came in a wide variety of formats: diaries, field journals, notebooks, letters, missives, doodles, and jottings. Given that so many of Livingstone’s writings survive – he is one of the most, if not the most, well recorded 19th century British explorer of Africa – they have an undue weight in the historical record, and as such it is not only important that we accurately encode and present the material but that we facilitate as many requests from the manuscripts as possible. At Livingstone Online we have recorded over 3,000 Livingstone or Livingstone-related items – in 15,000 images and 780 transcriptions – so it is clear that we have made a lot of curatorial and editorial decisions in the creation of the digital library and museum. As more and more collections and archives are presented digitally it is especially important in our academic communities that those decisions are transparent and that best practice comes out of sharing and discussion. Particularly when that content has been gathered and managed via digital imaging, multispectral imaging, photography, TEI-XML encoding, Drupal, CSS, HTML and multiple other ways and is thus malleable in both its form and make-up. That malleability is even evident in our team. The Livingstone Online team began as a disparate band of academics headed by our Victorianist director (Dr. Adrian Wisnicki), each with our own areas of expertise from textual analysis and imaging scientists to medical historians and geographers. Over the course of multiple projects and grants, however, the intermingling of our individual knowledge became the collective corpus on which we built our work: our project’s coding manual. My work on Livingstone began with the multispectral imaging of several documents that had either been written as a palimpsest or whose text had faded due to ink Livingstone made on the fly with local plants or materials that didn’t stand the test of time. With multispectral imaging, a document is bathed in varying wavelengths, with each wavelength being captured as distinct files. They can then be examined individually or layered together so as to bring the indecipherable text forward for clear viewing. For Livingstone’s other works that were still readable, spectral imaging was not needed and standard capture methods were employed. Once the digital object was created, of paramount focus was ensuring we accurately represented the nuances of both the document text and artifact, digitally. In the process of creating the digital object as an ultimately viewable representation on the computer screen, Livingstone Online uses TEI-XML markup to create elements, or tags, that identify information on the item as well as about the item. Elements are used to describe what is happening, such as where a line begins or what an item is, and they describe the structure, content and purpose of a document. They then have attributes within the tags that can further delineate details such as penmanship, authorship, foreign language, etc. Tags can be used to identify everything from date to distance, location to religion, a person to a spelling mistake, and an animal to a vegetable (tei-c.org). My work as a cataloger informed how to encode the documents and enhance our practices and manual through structure, collation, and consistency within the TEI-XML framework. For example, a regular deletion code doesn’t notate if the text was crossed out singly, scratched out with multiple lines, written over inline, or crossed out with the correction written above. To be as true to the textual representation as possible, these distinctions were teased out and coded accordingly through custom TEI element and attribute creations. TEI’s versatility helped us to play with their existing attributes, as well as add a few of our own. One thing that wasn’t obvious before a deep-dive into the transcriptions as a whole was that Livingstone covers not only a wide range of local plants, but foods, beverages, and rituals surrounding them. In order to more adequately capture that so that scholars could home in on all the plant life and food/beverages he documents, we added the attributes of plant_foodstuff and foodstuff to the TEI element “term”. What began as a 10-page document meant to give coding guidance for Livingstone’s letters glacially morphed into a 488-page GitHub coding manual almost a decade later that accounts for his letters, field diaries, and the behemoth Unyanyembe Journal, which chronicled six years of his continental travel across almost 800 pages. Though now a voluminous almost 500 pages, rest assured the manual is not intended to be read from start to finish – merely to be comprehensive coverage of any foreseeable circumstance one would need to code and how to drill right down to it. As one would use an encyclopedia, the coding manual is designed to be dipped into. Fairly early on the manual moved from being a .doc document to being held online by IT support at the University of Oxford, thanks to the work and support of James Cummings. This move made the document easier to navigate and negated the visual fear of being presented with a large technical document for our transcribers. One of its most important features, in my opinion, is that the manual is a responsive, living document that transparently represents how our project has grown in our coding practices to fit the needs of both the text as well as the researchers now using them. By tagging such things as medical conditions, geographical features, weather patterns and rainfall, flora/fauna, animals/insects, and food/drink to name a few, we facilitate the use of Livingstone’s texts for many different disciplines and scholars. Using the coding manual as a historian initially has one brilliant benefit, and that is I don’t need another specialist’s or team member’s scholarly knowledge as well as my own. Our work and individual knowledge engages with each other in the space in which the manual also sits. As mentioned above, the manual becomes both the document by, and the site in, which we share knowledge. And in many ways my scholarship is strengthened by the iteration of using the manual as the frame over which I hang my scholarship. The encoding practices and patterns I use give me a tangible interaction with the documents, by recreating Livingstone’s journeys in code on the page I engage with them in a very critical and detailed way. My interaction with exploration through the manual happens, now that I’ve thought about the process, in a very specific way. Firstly, I review: I fully engage with the text that is in front of me. A crucial slowed down analytical close reading process. The process of encoding creates a clear dialogue between myself and the text in which I can engage with both the remnant of the physical artefact and the digital object and its contents. It is at this point I separate the artefact from the content and begin to frame what I see in light of the questions the coding manual enables me to ask. I then reparse: I look at the components of the line I am transcribing and I identify its elements. I read the sentence for the whole, but in the process of transcription I am really looking at the words, their order, content and meaning. In many ways my work at this point is like a context-sensitive highlighter pen. In my head the process is running along the lines of, “This is here and this is one of those, and I don’t have to remember where the other ‘those’ are because I know I can do these searches at a later date”. I don’t have to know what I am looking for or what I want to do with the information I find at the point I am transcribing, what I am instead doing is facilitating these future possibilities. This stage of the work also means in the true sense of reparse that anyone coming along in the future will be able to take the marked-up text and reparse that into whatever format they are using. And thirdly, I reuse: although the coding manual avoids repetition, the physical iteration of transcribing and encoding, in some ways subliminally, teaches me as a literary scholar DH skills, in ways that theoretical coding might not be able to. Those who may be apprehensive about learning, or engaging in, a digital skillset may see such tools as too obtuse or difficult to relate to real world examples in the learning process. Personally I learnt to code in, and was confident in transcribing in, TEI-XML before I was aware that that was what I was doing. This in some ways is the very essence of digital humanities. As Burdick et al note, “Digital Humanities is a production‐based endeavor in which theoretical issues get tested in the design of implementations, and implementations are loci of theoretical reflection and elaboration”. It is the possibilities that such work creates in the conceptual design and critical encoding practices of digital repositories and libraries which serve to encourage reflective, disruptive and counter-consensus readings of intercultural encounter and the history of European exploration. It is the possibilities that such work creates in the conceptual design and critical encoding practices of digital repositories and libraries which serve to encourage reflective, disruptive and counter-consensus readings of intercultural encounter and the history of European exploration. Constructing a manual which facilitated interaction with disparate artifacts and was usable and effective for disparate scholars was arduous to say the least. But, ultimately it was the diversity of our team’s knowledge which enriched the manual, project, and our individual scholarship in ways not anticipated. One scholar’s knowledge of Scottish Gaelic, for example, informed another’s work when encoding foreign language tags; instead of coding “wersh” as an “undetermined” language or typo and its meaning potentially being buried, the interdisciplinary dialogue was able to retain its meaning (“bitter”) and illuminate the vitriolic context in which Livingstone was speaking. Elements like “tribe” and “nationality” quickly raised complex and controversial discussions that spanned coding practices, current interpretations, and implications contemporary to the time they were being used. This enabled not only an honest discourse over how certain terms propagate Victorian notions of representation and how we can challenge those notions through effective and transparent coding practices, but importantly a space in which these conversations could be had and documented. Another interesting progression we had within the project was around nationalities. At first, the only coding the manual covered was African tribes, as that was what Livingstone seemed to speak on the most. Yet, in progressing through his texts, we found the interplay between African tribes and other nationalities, both on the continent as well as in Europe, very important. We expanded our coding to include nationalities such as English, French, and Portuguese. We also differentiated between the adjectival usages of nationality and added the attribute of people or person to denote the actual people. But what about those “nationalities” that weren’t linked to a specific tribe or country? 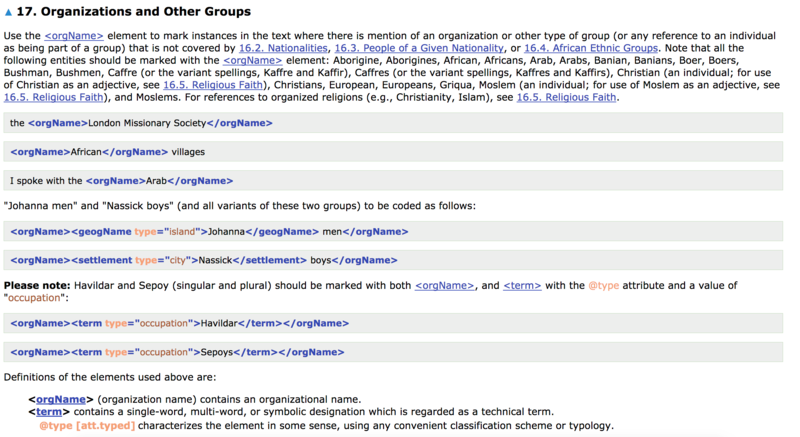 Arab, European, and African were the terms that drove that discussion, and for which we chose to employ orgName. Seems straightforward enough, right? Not for a cataloger! OrgName is one of Heather’s favorite tags because with its utilization we moved past TEI’s original use for it relating solely to organizations, and tried to represent each group as honestly and transparently as possible, as well as be sensitive to the social and political issues certain tags (for example, “tribe” vs “people” vs “orgName”) incite. These examples showcase different ways we have had to interact with the documentation and the choices we make in its creation. Subsequently, the purpose and the beauty of the coding manual is that for the user, these perspectives come together in a cohesive and well-informed representation of the page. Whilst at the same time, this evidences that within that self-same coding manual we attempt to make the configuration of knowledge horizontal, rather than hierarchical and so bound up with editorial judgements regarding “worth” of information. The Livingstone Online coding manual was from the very beginning of our project an integral part in our project’s scholarly communication, advancement, and collaboration. Not only does our coding manual have pedagogical merit for other projects, it served to contemporaneously teach our team how to work together and share knowledge across disciplines in a unifying vernacular that everyone became well-versed in and channeled their expertise through: TEI-XML. Our coding manual is not some dry, required piece of notation, but a responsive, multi-faceted, and engaging document that drove our project and fortuitously engaged our team in past and current social issues. If we wish to facilitate translation, transnationalism and contextual variances in our understanding of history, it is the digitization of critical heritage which will enable a more complicated and ambiguous reading of the historical record. Fundamental to this process is ensuring that in the digital library, the recorded, reported and referenced voice of the ‘other’ is identified in, and reported out of, the sometimes-silencing strictures of nineteenth century imperial historical hegemony, publications and/or singular interpretations. This destabilizing of interpretations – particularly important in readings of nineteenth century colonial African exploration history – is pursuant on beginning to be able to identify the indirect traces of the power and agency of all peoples. Our digital practice has evolved to enable such traces of African peoples and their dealings with Livingstone to begin to be highlighted. Specifically, the opportunities presented to the user are enriched by using the TEI encoding to provide meaningful searches across content. For instance, TEI markup means that users can search for mentions of the same place throughout a corpus, even if that single place has been spelt different ways by multiple authors or if a single author has themselves spelt a single place a variety of ways. Livingstone’s multiple spellings of village names like Metaba, which he also spells Matawa, Mataba or Metawa, or of people’s names, such as Mponda also known as Mponde, can be followed across various texts. Thus, the encoding of the text is invaluable, enabling as it does the searching of what Marion Thain phrases as “words not in the text but intimately tied to it”. The translation of imperial power through the written word and the almost subversive turn that digital mediation of the manuscript enables means that users of Livingstone Online can access the primary records in part unrestricted by nineteenth-century value structures of what was useful, what was not, what constituted proper sources of knowledge, and what did not. Our interdisciplinary work in the creation of the coding manual has facilitated such subversive readings, providing a platform in which we shape and importantly evidence new structural frameworks of knowledge creation. In nineteenth century publications, the African person was often ‘othered,’ de-individualized, and made strange. The digital technologies and coding practices we adhere to at Livingstone Online are not only bringing these people forward within the data, they are allowing the record of exploration to be contested, critiqued, and challenged in ways that allow for new interpretations and readings; not only by us now, but by future users hopefully in ways even we have not yet seen. ‘The Transvaal’, 1876, p. 8 <https://doi.org/10.2307/60246804>. Anne Burdick and others, Digital Humanities (Massachusetts: The MIT Press, 2012), p. 13. Marion Thain, ‘Perspective: Digitizing the Diary – Experiments in Queer Encoding (A Retrospective and a Prospective)’, Journal of Victorian Culture, 2016, 226 (p. 233) <https://doi.org/10.1080/13555502.2016.1156014>. 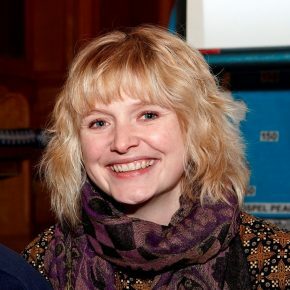 Kate Simpson is Fellow at the Institute of Advanced Studies in the Humanities at Edinburgh University and a Lecturer in English and Film at Edinburgh Napier University. She is Project Scholar and UK Outreach Director for Livingstone Online. Her current research project entitled Boundaries of gender: ‘petticoat governments’ and secondary voices in nineteenth century European expeditions of Africa – mines digital content to foreground the many women, both European and African, who assisted and enabled David Livingstone (1813-1873) in his journeys in Africa. Heather F. Ball is an Assistant Professor and Student Success Librarian at St. John’s University. She holds an MLS with dual certificate in Preservation and Archives, as well as an MLitt and Bachelor’s in Medieval Studies. She sits on several committees for the Library and University, as well as being elected to ACRL’s ULS Membership Committee. 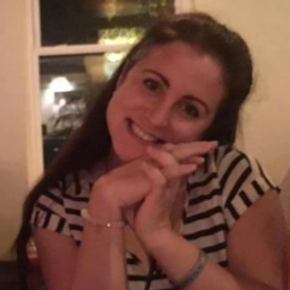 Her research interests include qualitative and quantitative data analysis, assessment measures, information literacy instruction, digitization and encoding of historical manuscripts, Geoffrey of Monmouth, and twelfth-century Britain.